Ronaldo Webster (left) of St Elizabeth Technical High School tries to move ahead of two Kingston College's defenders during the second match of the 2018 ISSA Champions Cup at Sabina Park on Saturday night. (PHOTOS: Marlon Reid). A new champion will be crowned in the 2018 ISSA rebranded Champions Cup as St Elizabeth Technical High School (STETHS) ended the reign of Kingston College (KC) on day one of the all-island knockout competition on Friday. 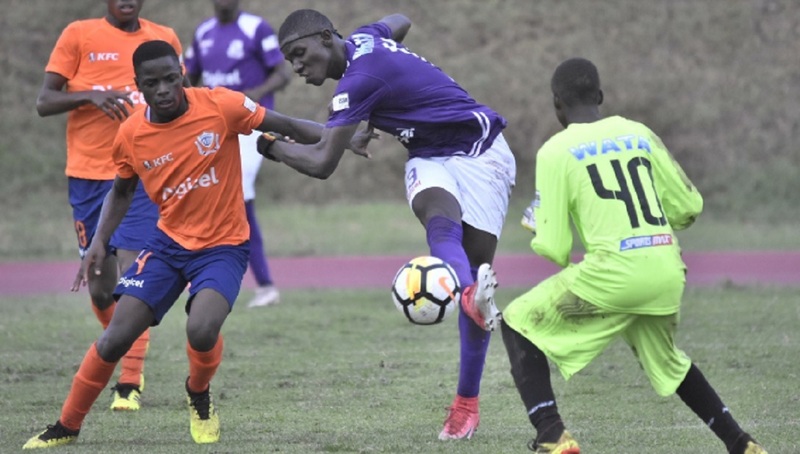 STETHS got home courtesy of a 6-5 sudden death penalty shoot-out win in the second match of a doubleheader at Sabina Park. The dreaded penalty was used to separate the teams after they battled to a 1-1 draw at the end of full time. Victory was sweet revenge for STETHS who lost 3-0 against KC in the final of the competition, which for the first four years was called Super Cup before the all-island knockout competition was rebranded this season with a new trophy. Deandre Brown got the all-important goal for STETHS after goalkeeper Devonte Clarke had saved KC's eighth penalty taken by Scott McLeod. KC's Ugandan student Ari Rodgers and Dwayne Atkinson, both second-half subs, also missed for the 2017 champions. 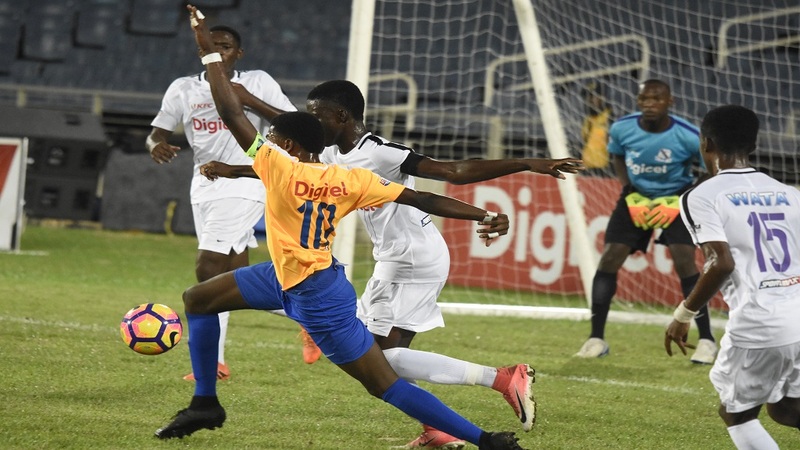 Stand-in captain Trayvone Reid, Brandon Allen, Jahmari Morrison, substitute goalkeeper Nathaniel Francis and Sakeem Edmonson scored from the penalty spot for KC. 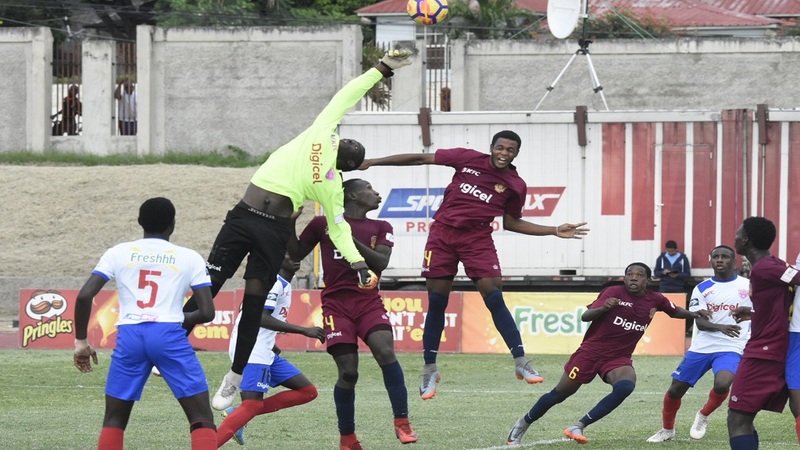 Goalkeeper Devonte Clarke, Tajay Green, Antonio Briggs, Ronaldo Webster, Kevaun Garwood were the other scorers for STETHS from the penalty spot. Shemar Murray and Tajay Palmer missed their spot kicks. Earlier, KC had to come from behind to force the penalty shootout. Garwood put STETHS 1-0 ahead in the 29th minute from the edge of the 18-yard box. Green set up the goal when he played back a ball from the right side of the field and Garwood latched onto it and easily played out of the reach of KC's goalkeeper Devonte Bancroft. KC should have equalized six minutes later but the gifted Reid found the far post with goalkeeper Clarke well beaten. The defending champions finally got the equalizer and it came moments after the introduction of Atkinson and Rodgers. A moment of brilliance from Morrison after Rodgers was fouled levelled the scores. The KC striker curled a 25-yard free-kick around the defensive wall of STETHS and into the top corner of the goal. It was the fifth goal for Morrison this season. Reid should have won the game for KC in the 88th minute when he was set up by Rodgers inside the box, but missed with Clarke at his mercy. It was the first defeat for KC this season. 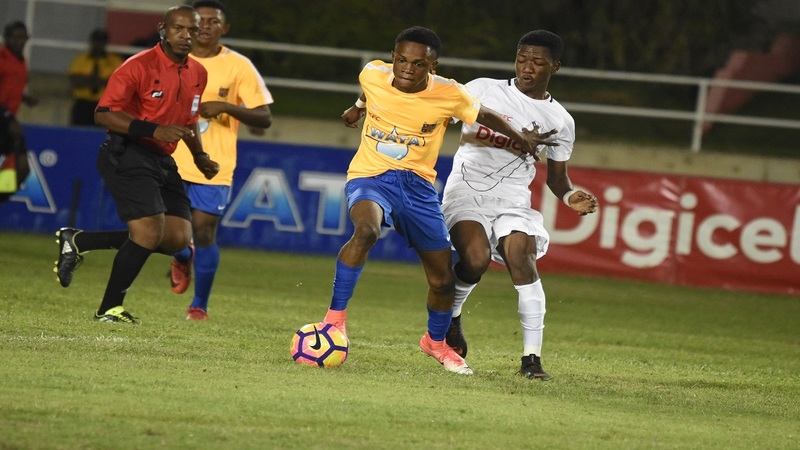 The Ludlow Bernard-coached has reached the semi-finals of the Manning Cup with an impressive record of 13 victories and two draws from 15 games. Earlier, in the opening game of the Champions Cup season, St George’s College, the 2015 champions, easily beat Garvey Maceo 2-0. Emelio Rousseau (2nd minute) and Damani Harris (31st minute) scored for St George's College. 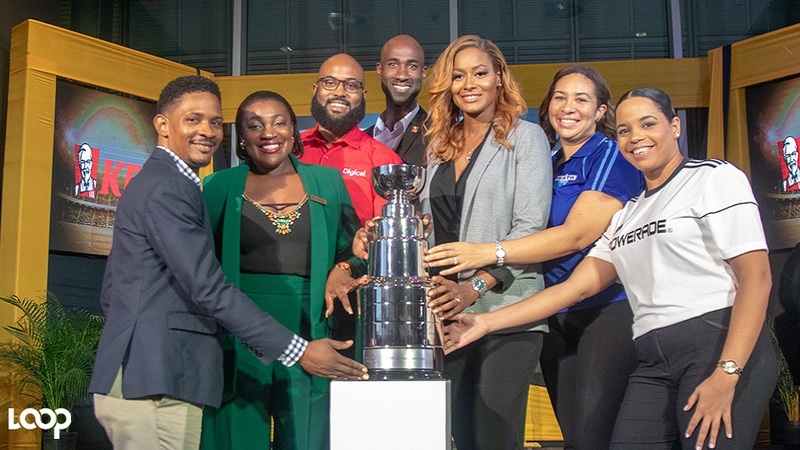 The Champions Cup features the eight teams that won their second-round Manning Cup two-way play-off games and the eight teams that finished as winners and runners-up in their respective daCosta Cup quarterfinals groups.